I’ve released a few newish things in my shop and on the marketplace. First up, I decided to expand the color range of my hunt prize for the DollHouse hunt back in November. Dolly Makeup – 7 colors in light and dark versions to work with an array of skin tones. Each makeup comes in 3 versions, Makeup Only, Lipstick Only, and Makeup+Lipstick. Includes Catwa, Lelutka, Omega, LAQ & AK appliers as well as system tattoo layers. 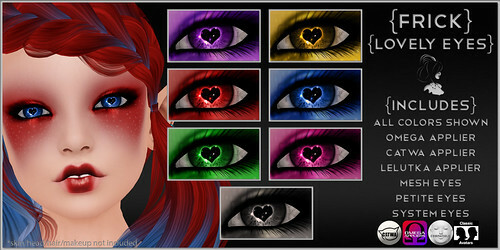 Lovely Eyes – 7 colors in the pack. Includes Lelutka, Catwa & Omega appliers. 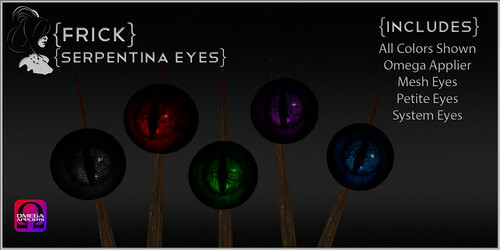 The Lelutka & Catwa appliers allow you to apply colors individually to each eye. Also includes mesh, petite and system eyes. 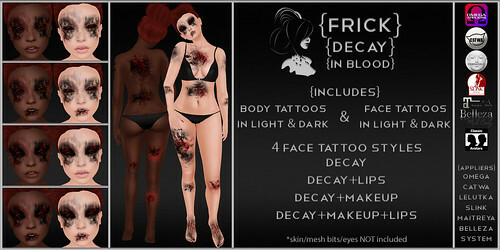 Next up, I’m re-releasing my Halloween Hunt items after a few requests to do so. I did update the appliers a bit with a new all included HUD but the old ones have the exact same textures so if you picked these up during the hunt, you don’t need to purchase them again. 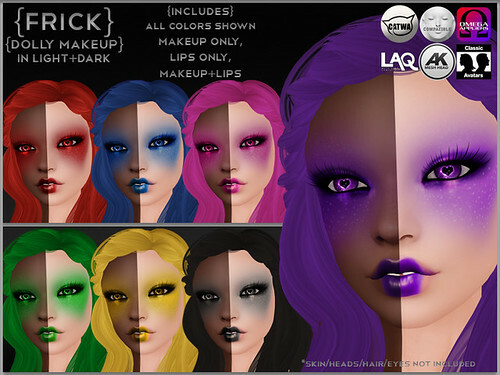 Follies Makeup – 5 colors in light and dark versions. 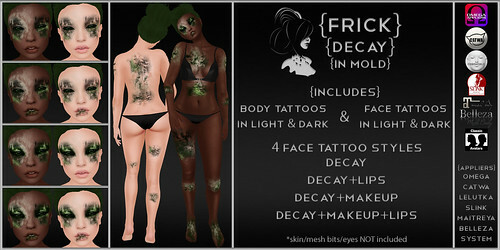 Comes with Catwa, Lelutka, Omega, LAQ & AK appliers as well as system tattoo layers. 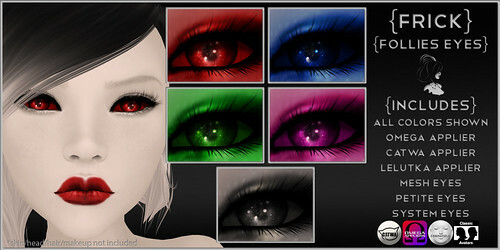 Follies Eyes – 5 colors in the pack. 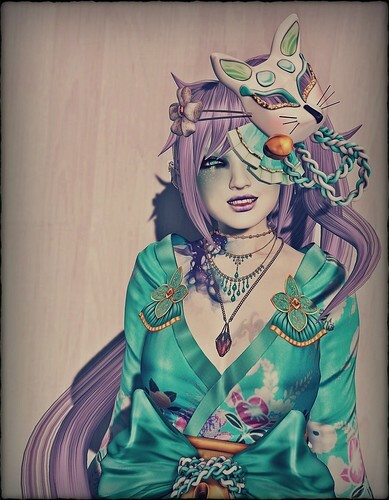 Includes Lelutka, Catwa & Omega appliers. 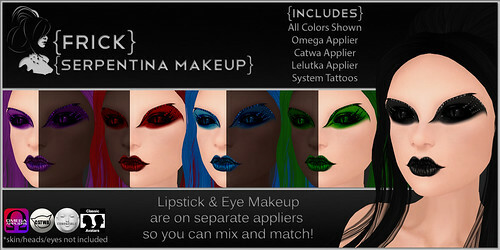 The Lelutka & Catwa appliers allow you to apply colors individually to each eye. Also includes mesh, petite and system eyes. Yes, it’s that time again! Time for my annual Halloween Dollarbie Hunt! 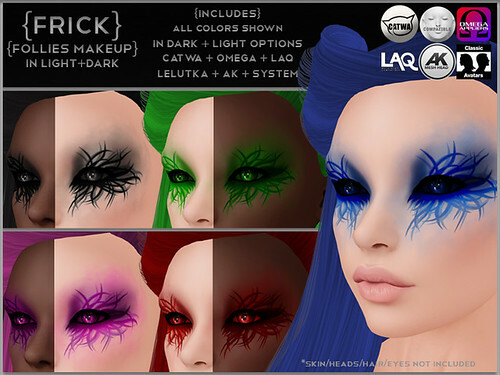 This year’s offering is 6 makeups in light and dark with Omega, Lelutka Bento & Catwa appliers as well as system layers and 6 sets of eyes with Lelutka & Omega appliers and Mesh, Petite & System Eyes. I have to say, this is one of my favorite makeups I’ve made so I hope you guys like it! Happy Halloween!